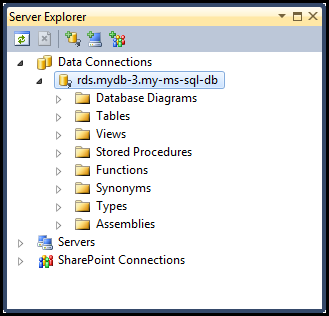 Microsoft SQL Server is designed in such a way that, after launching an Amazon RDS instance, you need to create an SQL Server database in the RDS instance. 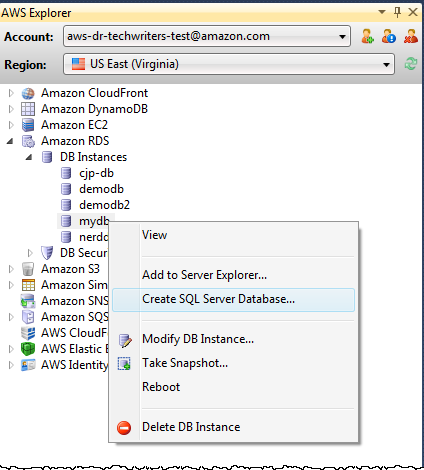 For information about how to create an Amazon RDS instance, see Launch an Amazon RDS Database Instance. In AWS Explorer, open the context (right-click) menu for the node that corresponds to your RDS instance for Microsoft SQL Server, and choose Create SQL Server Database. 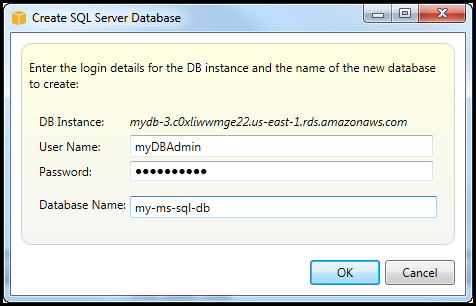 In the Create SQL Server Database dialog box, type the password you specified when you created the RDS instance, type a name for the Microsoft SQL Server database, and then choose OK. The Toolkit for Visual Studio creates the Microsoft SQL Server database and adds it to the Visual Studio Server Explorer.